I have to admit I did not even know that King Fowley had another band going on top of Deceased. Turns out October 31 is not as old as King’s other, more famous, gig, but still named after Halloween troupe has been in existence since mid-90s. On October 31 King Fowley has collaboration from a pair of other famous Virginia musicians, i.e. Brian Williams (guitars) and Jim Hunter (bass, While Heaven Wept, Twisted Tower Dire). It appears that with Gone to the Devil EP October 31 are trying to revive their past. In time for this rebirth Hells Headbangers will reissue the band’s first pair of full-length albums The Fire Awaits You and Meet Thy Maker. Consider this quick note of a review a plug for you to go and check out those re-releases, since they are considered to be pretty cult in the retro metal circles, or so my research on the band shows. 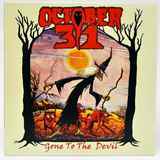 Gone to the Devil puts out only one new original song, and on the surface, compared to the Deceased anyway, October 31 are playing a lot more straightforward, very much no frills traditional/speed metal. The chords are pretty simple progression, and even though the solo is uncorked mid-way, there is not a hell of a lot of songwriting complexity in this track. Instead, the song relies very much on its rugged simplicity and some crazy feedback showing up in the guitar sound. King sounds pretty much his raspy self, but unlike Deceased in its most glorious Supernatural Addiction moment, October 31 have to rely on his vocals to carry the load, and that may be a tall order. On the other hand, with the cover of Uriah Heep’s Too Scared to Run October 31 has access to a soaring melody. Guitar hooks come through great on that song and King is forced to sing a little cleaner, which is not entirely a bad thing, even though the man has his limitations (and probably knows about them). The jury is out on how smashing the next October 31 album will be given one new song, but I think it will be worth an effort for me to familiarize myself more with the band through a pair of those early albums.